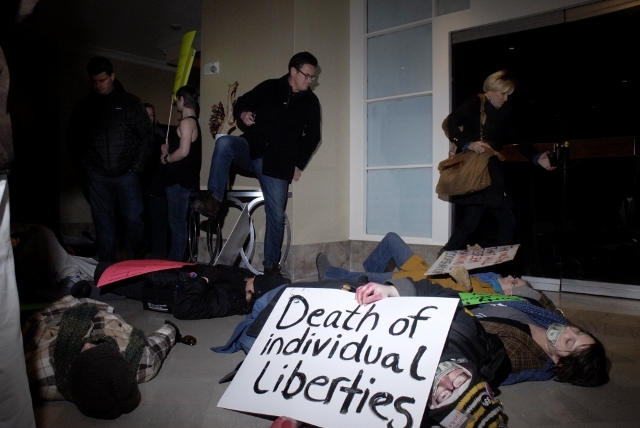 On Monday afternoon, 12 Occupy Iowa Caucus protesters were arrested after staging a die-in at a Des Moines hotel where the Democratic National Committee has set up a communications “war room” in preparation for Tuesday’s caucuses. The move came after protesters delivered an invitation on Sunday asking the DNC chair, Rep. Debbie Wasserman Schultz of Florida, to hear their complaints in person. According to the occupiers, Schultz declined the offer, saying she would be out of town Monday. In a press release, protesters claimed that DNC officials “hid in a second floor room, locked the doors, and called police” to avoid speaking with them after they returned to the Renaissance Des Moines Savery Hotel on Monday. But no one was in the war room immediately before protesters arrived. A hotel staffer said the officials had left the building before the protesters arrived and planned to come back later in the day. About 40 people, marching silently to the beat of a drum, had arrived at the hotel, where they criticized Democrats for the party’s ties to Wall Street and Barack Obama’s support of the National Defense Authorization Act. Two dozen protesters then lay on a lobby floor near a staircase to which the hotel’s general manager, Rick Gaede, had blocked access. Across the lobby, two disinterested businessmen in suits ate lunch at a hotel restaurant. A hotel staffer called police, who told reporters and protesters that anyone (other than hotel guests and staff) who stayed in the building would face arrest. MSNBC host Joe Scarborough, who is staying at the hotel while he covers the Iowa caucuses, watched the protest with his Morning Joe cohost Mika Brzezinski. Outside, he interviewed Tony Tyler of Occupy Des Moines. Tyler told me he agreed to speak after Scarborough promised that he would show a clip from the interview to Schultz, who is scheduled to appear on Morning Joe Tuesday morning. Iowa police have arrested protesters on 59 occasions since Occupy Des Moines’ December 27 People’s Caucus, where the group first discussed plans to protest outside candidates’ campaign headquarters.